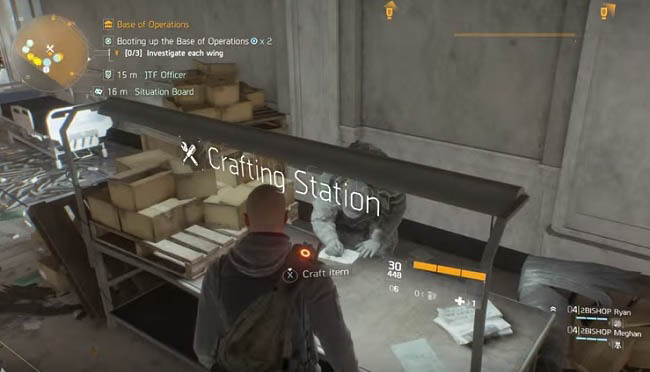 In this post I'm going to explain how crafting works in The Division. 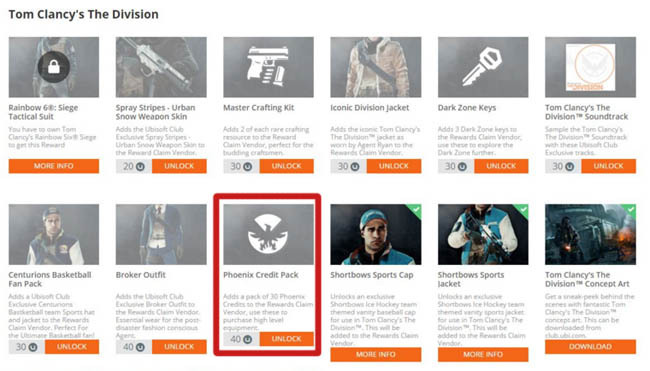 Similar to other RPG games, you can craft many different items in The Division ranging from weapons, mods and gear (but not cosmetics). 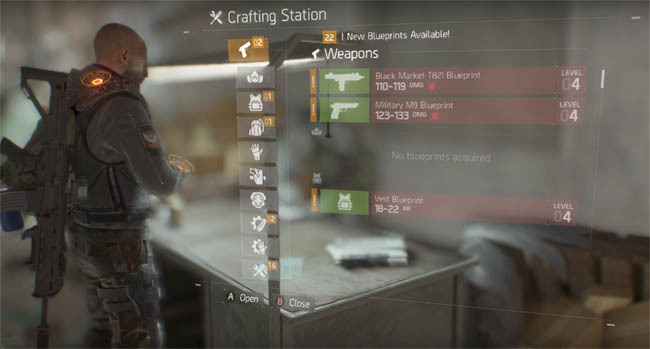 Although many common items are available to craft immediately, some of the the best items require a special Blueprint (recipe) for their creation and most of these Blueprints are rewards from high level enemies, often in the Dark Zone. Simply approach the desk and hold the action button (X on PS4) to open the in game crafting screen. This crafting screen allows you to craft all sorts of gear from weapons, gas masks, armour, backpacks, gear mods etc.. Pretty much any item you can find in the open world can be crafted from scratch (although not cosmetic gear). Of course you can collect gear in the open world by looting dead bodies, finding it lying around or even as a reward for a quest, but crafting allows you to create items of your choosing rather than relying on RNG for your rewards. It's also a better way to create reusable mods such as silencers which are not tied to a particular weapon, thus forcing you to keep said weapon rather than putting the mod on an alternative weapon. What's nice is that apart from the material, crafting items doesn't consume any money so you can save that for purchasing new weapons and gear instead. 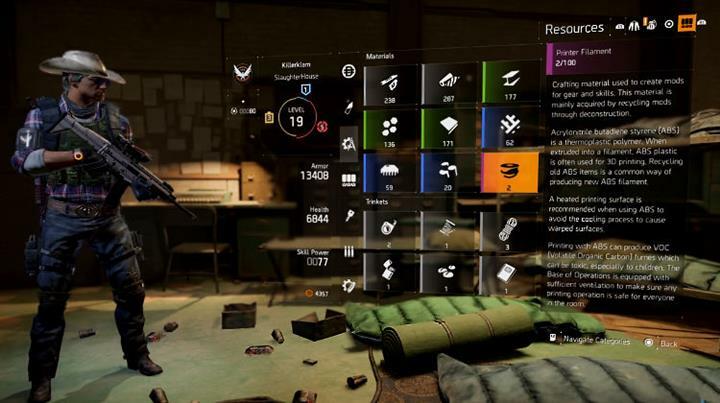 Apart from finding resources scattered around the open world, you can also choose to break down your existing gear to get raw resources. Dismantling a particular item will give you resources that fit with that category. So for example, dismantled a weapon will give you weapon parts, simple. In addition to the type resource, there are also colour classifications, similar to the classifications for gear rarity. These colours range from grey (common), green (standard), blue (specialised), purple (superior) and up to orange (high-end), which is the highest tier and also the best. Again, dismantling gear of a certain colour will give you resources of that colour. So if you dismantled a green (standard) gun, you would get green (standard) weapon parts. Thankfully the game also offers a resource conversion system, which is also built into the crafting screen. This allows you to convert lesser quality resources into more valuable resources such as orange materials (high-end). It costs roughly double the amount of lower tier materials to gain one of a higher tier. So you would need 2 x purple materials to convert to 1 x orange.